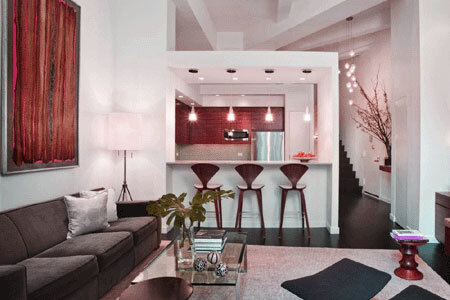 Duplex staging can bring out the wonderful appeal of any multilevel apartment or townhouse. Duplexes are often favored by buyers who are looking for a more house-like environment in an apartment, since the dual floor set-up affords more options and privacy than a one level floor plan. Duplex home staging is a niche specialty of apartment staging, which incorporates aspects of typical house staging to make the most of the diversity of spaces offered by the architecture of the residence. This editorial concentrates on the urban definition of a single family duplex and does not focus on duplexes which consist of multifamily units within the same building. A duplex is defined as an apartment with more than one level of living space. If the apartment has 2 floors, then it qualifies to be called a duplex. If the unit has 3 floors, then it is really a triplex. Typically, the kitchen, guest bath and living room areas are on the main level, with the bedrooms and master bathroom on the upper or lower level, depending on the design. Duplex apartments are generally more expensive than single level dwellings of comparable size and quality, making staging these units even more advantageous to bring out every last dollar of value when selling the property. In order to optimize the impact of a duplex, make sure to have strong distinctions between the public and private area of the apartment. Take advantage of the multiple level floor plan to create an oasis of relaxation in the master suite. Duplexes with a bonus room can be set up with a dedicated home office, making them a perfect fit for the multitude of prospective buyers who telecommute or work from home. Avoid allowing the décor to appear scattered and detached between the 2 floors. Make sure to use a cohesive design throughout the apartment, tying the individual levels together for an appealing aesthetic. Duplexes are lovely and are valuable pieces of real estate. High-end duplex apartments, in ideal locations, can be far more expensive than much larger single family detached homes. Remember that the quality, neighborhood and age of the building will greatly impact the selling price of the unit. Although you can not change these details, you can certainly improve the relative value of the apartment by staging it to sell. A final word of advice: When staging a duplex, make sure to highlight common areas which have universal appeal, such as building gyms, pools, parking or storage spaces. These add-ons can provide increased value, making the unit stand out among its competition.